With the standard HDD installation solution inside the PIPs, the HDD is mounted with brackets on the PIP case cover. This solution is reliable and cost-effective. The only disadvantage is that for an exchange of the HDD, the PIP cover has to be opened. Depending on the application, this is not always desirable or even possible. 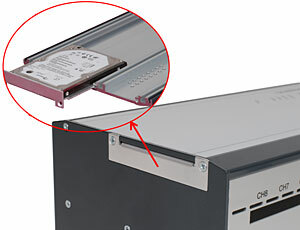 The new HDD drawer solution now offers easy access to the installed SATA-HDD! The SATA-Remove1 can be used in combination with any 2.5" standard SATA-HDD and any PIP with SATA interface. Since a longer cable would be required to pull out the HDD, the cable length defined in the PATA specification would be exceeded.